FILE - Laborers work at a construction site at the Palm Jumeirah, in Dubai, United Arab Emirates. A report shows increasing numbers of migrants are moving to cities around the world to take advantage of the many opportunities urban centers offer. The International Organization for Migration’s World Migration Report 2015 focuses on both the risks and opportunities created by the rate of fast urbanization. More than half of the world’s population lives in cities. Demographers expect the current urban population of 3.9 billion to grow to an estimated 6.4 billion by 2050. That means nearly 70 percent of the global population will be living in urban areas. The International Organization for Migration reports migration is driving much of the increase. It says most of the movement to big cities happens within countries and not as a consequence of people seeking a better life abroad. The latest statistics show there are an estimated 230 million international migrants and more than 740 million internal migrants. The report’s editor-in-chief, June Lee, said one in seven people on the planet is on the move, with most heading for big cities within their own country. She said most of the migrants do not have the right to legally reside in their national urban centers. 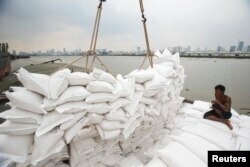 A migrant worker unloads sacks of rice from a barge to a cargo ship on The Chao Phraya River in Bangkok, Thailand, Aug. 27, 2014. She said they resort to irregular means, which makes them vulnerable to exploitation. Lee said the migrants usually live in informal settlements and work in black market jobs, where they live in fear of being discovered and are open to abuse. “They still make a living, find opportunity for employment and income and also protection. They are coming away from disaster, possibly and political instability back home. So, they find nonetheless, protection, opportunity in their harsh environment. Therefore, it is very difficult to stop,” said Lee. Lee says about 85 percent of more than 100 countries surveyed by the United Nations have policies in place to halt urban migration. Given the global realities of aging societies, she says large-scale migration to urban centers is inevitable. Therefore, city authorities should come up with policies that better integrate migrants as a beneficial part of their communities. The report finds about 50 percent of international migrants live in 10 highly urbanized, wealthy countries, including Australia, Canada, the United States, and several countries in Europe and the Middle East. But, it notes almost all of the population growth of 2.5 billion people over the next few decades is expected to be in urban areas in poorer African and Asian countries.